According to the Guidelines of the American Academy of Orofacial Pain Temporomandibular disorders (TMD) is defined as, ‘a collective term embracing a number of clinical problems that involve the masticatory musculature, the temporomandibular joints and associated structures, or both[1,2]. Temporomandibular disorders have been recognized as a common orofacial pain condition. The American Dental Association in 1983 has suggested that the term Temporo Mandibular Disorders (TMD) refers to a group of disorders characterized by: pain in the Temporo Mandibular Joint (TMJ), the periauricular area, or the muscles of mastication; TMJ noises (sounds) during mandibular function; and deviations or restriction in mandibular range of motion. The etiology of TMD has been considered to be one of the most controversial issues in clinical dentistry. A majority of dental practitioners believe that occlusal disturbances can cause or are closely related to TMD, and many therefore also include occlusal adjustment as an initial treatment for TMD, whereas most TMD experts hold opposing views[4-6]. Restorative procedures are divided into two types-. (1) Operative and (2) fixed prosthodontic. Operative procedures are those in which the final restorations are fabricated intrao-rally (e.g., an amalgam, a composite resin). Fixed prosthodontic procedures are those that involve extraoral fabrication with final adjustment and cementation in the mouth (e.g., inlays, onlays, full crowns, fixed partial dentures. The prevalence of TMD is still not well known and more studies and comparisons are necessary to allow better understanding of the pathological aspects so as to address effective preventive and therapeutic measures. Few studies reported the prevalence of TMD in Saudi Arabia in normal permanent dentition and adults[8,9]. If your teeth don’t meet evenly, such as when you have a new filling or crown that is slightly “high”, this could cause pain on biting or with extremes of temperature. In the long term you could develop mobile teeth, receding gums, fractures, abnormal wear, tension headaches and even jaw joint problems such as stiffness, clicking and locking (British academy of restorative dentistry). A review of the scientific literature reveals that five major factors associated with TMDs. These factors are the occlusal condition, trauma, emotional stress, deep pain input, and parafunctional activities. Three general classes of record are used for transferring maxilla-mandibular relationships from the patient to the articulator including Interocclusal and hinge axis records. As well as, the graphic records. The reproducibility of occlusal marking technique is low. In studying the influence of force and jaw position on the number of tooth contacts, most restorative procedures cannot be performed without influencing to some degree the existing occlusal condition. The potential effect of restorative procedures on the occlusion is obvious when a complete reconstruction of the dentition is being considered. However, one should be aware that even an occlusal amalgam can have a significant effect on the occlusion when the restoration is undercarved or over carved[12-14]. The observation that many subjects have “occlusal abnormality” without TMD has clearly encouraged reviewers to conclude that occlusal factors have no significant etiological role[2,15]. Results of experimental interference studies are also seen as strong evidence for the same conclusion. The hypothesis, “dental occlusion plays a significant causal role in temporomandibular disorders”, has been a central point of contention for many decades in the attempt to understand these disorders. Recently, certain authors have asserted that the scientific literature does not support this hypothesis determining the cause(s) of TMDs is far from a straightforward and simple process. There is general agreement that TMD is a broad, generic term that encompasses a wide variation of conditions involving the masticatory musculoskeletal structures. There is also wide agreement that causation related to TMDs is of multi factorial origin. The likelihood of identifying any single “cause” as having a predominant role is clearly remote. The aim of this research is to show the relationship between the occlusal interference with fixed prosthesis, restorations, and tempromandibular disorder. Request for ethical Approval for this study will be made by applying to College of Dentistry Research Center. The target population this study is male patients attending one governmental and one private hospital in Riyadh The age range for these patients will be limited to age (18 – 70 years old). The patient will identify in undergraduate clinics, intern and post graduate clinics. All of the patient must have a FPD & restorations. The questionnaire to be used in this study will be in Arabic. The questionnaire it will determine if there is a correlation between TMD, FPD & restorations. Firstly, the following information was collected: the demographic information such as patient’s age, education, employment status, parity, and economic status .then the past dental history data were collected including some medical relevant as (did you have any medical problem, did have any complication with dental treatment, did you take any medications, etc). The last part is the relation between TMD, FPD & restoration. We focused on the questions about the history of TMD and if there are complications occurred after the prostho-opreative treatment. For example did you have any clicking or deviation or pain in your joint? yes/no .as we mention all the patient must have crowns or FPD or restoration, then the next questions it will be (when they do the treatment, how many crowns he have, any differentiations between the treatment, if its high, if they feel pain in muscle and jaw after treatment etc). The questionnaires were initially tested for clarity and accuracy on a sample of 100 male patients. After making necessary changes in the tested questionnaire, the questionnaire were given to supervisor of the clinic in DUC and also to the private clinic. A total of 300 male patients investigated in this study. All the collected data were statistically analyzed using SPSS version 21 software. The Chi square tests were used to determine the significant relations. Table 1 shows that the distribution of the study sample according to the variable Age that the vast majority (217) of the study sample, representing a rate of (72.3%) of the total study sample age (from 20 to less than 25 years old), while it was found that (29) of the study sample, representing a rate of (9.7%) of the total study sample age (from 25 to less than 30), also found that (12) of the study sample, representing a rate of (4%) of the total study sample age ( from 35 to less than 40 years old ), while equal proportion of the study sample holders ages (less than 20 years old, from 30 to less than 35 years, from 50 years and above ) and that by (3%) of the total study sample, while it was found that ( 8) of the study sample, representing a rate of (2.7%) of the total study sample age (from 40 to less than 45 years) and finally found that (7) of the study sample, representing a rate of (2.3%) of the total study sample age ( from 45 to less than 50 years). Table 1: Distribution of the study sample according to the variable Age. Table 2 show that distribution of the study sample according to the variable work, it shows that the vast majority (240) of the study sample, representing a rate of (80%) of the total sample individuals (students), while it was found that (17) of the study sample representing a rate of (5.7%) of the total study sample employed in the police, while it was found that (15) of the study sample, representing a rate of (5%) of the total study sample employed in government jobs, also found that (5) of the study sample representing a rate of (1.7%) of the total study sample teachers , while it was found that (4) of the study sample representing (1.3%) of the total study sample, “doctors”. Table 2: Distribution of the study sample according to the variable work. From Table 3, it is indicated that (0.3%) of the total study sample complain of neurological disorders, while it was found that (0.7%) of the total study sample complain of musculoskeletal disorders, arthritis, also found that (2.3%) of the total study sample complain of psychological pressure, and finally found that (3.3%) of the total study sample complain (stomach pain, headaches, anemia, Orthodontic, disability, asthma, ligamentin the knee). Table 3: Distribution of the study sample according to medical problems. Medical problem not listed above (stomach pain, headaches, anemia, Orthodontic, disability, asthma, ligament in the knee). Seen from Table 4 the distribution of the study sample according to the number of combinations or restorations that have shown that (118) of the study sample, representing a rate of (39.3%) of the total members of the sample number of combinations or restorations that have (more than 3), while found that (76) of the study sample, representing a rate of (25.3%) of the total study sample number of combinations or restorations that have (one restoration ), while it was found that (74) of the study sample, representing a rate of (24.7%) of the total study sample number of combinations or restorations that have (two restorations), and finally found that (32) of the study sample, representing a rate of ( 10.7% ) of the total study sample number of combinations or restorations that they have (three restorations). Table 4: Distribution of the study sample according to the number of restorations. From Table 5, it is indicated that the (124) of the study sample, representing a rate of (41.3%) of the total members of the duration where treatment combinations or restorations (over a year), while it was found that (73) of the study sample, representing a rate of (24.3%) of the total study sample duration where treatment combinations or restorations (before 6 months), while it was found that (52) of the study sample, representing a rate of (17.3%) of the total study sample wares or restorations (a month ago) and, finally, it was found that (51) of the study sample, representing a rate of (17%) of the total study sample duration where treatment combinations or restorations (a year ago). Table 5: Time of dental treatment. Time of completion of the treatment of FPD or Restorations? Through a review of Table 6 shows that the 194) of the study sample, representing a rate of (64.7%) of the total members were subjected to treatment (restorations), while it was found that (53) of the study sample, representing a rate of (17.7%) of the total members of the sample The study underwent treatment (fixtures and restorations together), while it was found that (32) of the study sample, representing a rate of (10.7%) of the total study sample were subjected to treatment (formulations), and finally found that (11) of the study sample, representing a rate of (3.7%) of the total study sample were subjected to treatment (formulations, fillers, implant) and finally found that (10) of the study sample, representing a rate of (3.3%) of the total study sample were subjected to treatment (Implant). Table 6: Type of dental treatment. What is the type of treatment you have? Through a review of the Table 7 shows that the vast majority (179) of the study sample, representing a rate of (59.7%) do not suspect any of the conditions listed above, while it was found that (46) of the study sample, representing a rate of (15.3%) of the total members of the sample the study complained of (psychological stress), while it was found that (28) of the study sample, representing a rate of (9.3%) of the total study sample complain (arthritis), while it was found that (21) of the study sample, representing a rate of (7%) of the total study sample complain (musculoskeletal disorders), also found that (17) of the study sample, representing a rate of (5.7%) of the total study sample complain (neurological disorders), and finally equal proportion of the study sample who complain of (psychological pressure and neurological disorders, psychological pressure and muscle and nerve disorders). Table 7: Patients suffer of other diseases. Do you suffer of any of the following diseases? 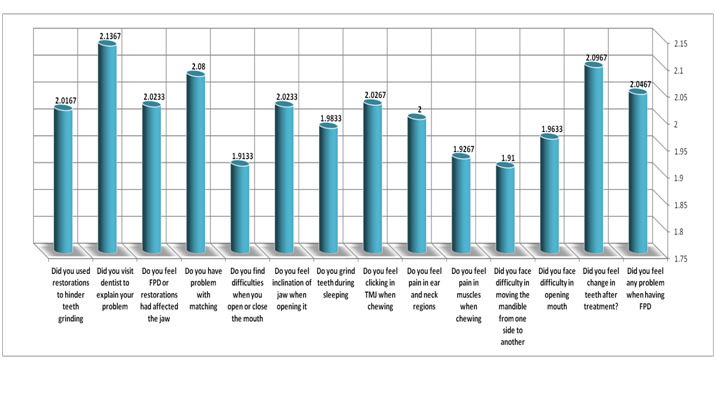 Can be seen from Table 8 that the (151) of the study sample, representing a rate of (50.3%) complain (dental caries), while it was found that (29) of the study sample, representing a rate of (9.7%) of the total study sample complain (dental caries and teeth fracture), while it was found that (20) of the study sample, representing a rate of (6.7%) of the total study sample complain (caries in teeth and an imbalance in the match), while it was found that (12) of the study sample representing (4%) of the total study sample complain (break-up teeth), also found that (11) of the study sample, representing a rate of (3.7%) of the total study sample complain of (problems in the fixtures and a defect in the match), and found also that (9) of the study sample, representing a rate of (3%) of the total study sample complain of (a defect in the match), while it was found that (5) of the study sample, representing a rate of (1.7%) of the total study sample complain of decay in teeth and problems in formulations, and finally found that (4) of the study sample, representing a rate of (1.3%) of the total study sample members complain of (problems in the formulations). Table 8: Suffering from other teeth problem. Seen from Table 9 that the (117) of the study sample, representing a rate of (39%) of the total study sample complain of the presence of caries in teeth, while it was found that (105) of the study sample, representing a rate of (35%) of the total members the study sample does not complain of anything, while it was found that (28) of the study sample, representing a rate of (9.3%) of the total study sample complain (break in fixtures or restorations). Also, it was found that (19) of the study sample representing a rate of (6.3%) of the total study sample complain of (the presence of caries in teeth and break in fixtures or restorations), while equal proportion of the study sample who suffer from (a rise in installations) with the proportion of the study sample who suffer from (decrease of the level of congruence) with a rate of (3.7%) of the total study sample for both of them, and found that (6) of the study sample, representing a rate of (2%) of the total study sample complain of (the existence of decay and a rise in installations). Table 9: Complaining from any problems in FPD or Restorations. From Table 10 and Figure 1 , it is indicated that (71.3%) of the total study sample did not feel any problem when undergoing treatment combinations, while it was found that (16.7%) of the study sample are problems when undergoing treatment for restorations, and finally found that (12%) of the study sample are sometimes problems when undergoing treatment combinations. Also (68.3%) of the total study sample does not match the teeth feel change upon completion of the treatment, while it was found that (20.7%) of the study sample are changing the match dental Upon completion of the treatment. Table 10: Diagnostic questions for TMD. Did you feel any problem when having FPD? Did you feel change in teeth after treatment? Did you face difficulty in opening mouth? Did you face difficulty in moving the mandible from one side to another? Do you feel pain in muscles when chewing? Do you feel pain in ear and neck regions? Do you feel clicking in TMJ when chewing? Do you grind teeth during sleeping? Do you feel inclination of jaw when opening it? Do you have problem with matching? Do you feel FPD or restorations had affected the jaw? Did you visit dentist to explain your problem? Did you usedrestorations to hinder teeth grinding? Figure 1: Means of diagnostic questions. While it was found that (11%) of the study sample feel sometimes changing the match teeth upon completion of treatment. (81%) of the total study sample do not face difficulty in opening their mouth when installation or fillers, while it was found that (11.3%) of the study sample face sometimes difficult to open their mouth when installation or fillers, while found to be (7.7%) of the study sample are having difficulty in opening their mouth when installation or fillers. Also, (77%) of the total study sample do not face difficulty in moving the jaw from side to side when the installation or fillers, while it was found that (16%) of the study sample face sometimes difficult to open their mouth when installation or fillers, while found that (7%) of the study sample are having difficulty in moving the jaw from side to side when the installation or fillers. Moreover, (83%) of the total study sample did not feel Milan jaw when you open or close towards any destination, while it was found that (9.7%) of the study sample feel Milan jaw when you open or close towards any destination, while it was found that (7.3%) the study sample of individuals sometimes feel Milan jaw when you open or close towards any party and (79.3%) of the total study sample do not find difficulties when you open or close the mouth, while it was found that (14.7%) of the study sample have sometimes difficulties when you open or close the mouth, while it was found that (7.3%) of the sample the study sometimes feel Milan jaw when you open or close towards any party. And (80%) of the total study sample have a problem when the match in hand without the other, while it was found that (14%) of the study sample have a problem when the match in hand without the other. Furthermore, it was found that (6%) of the study sample find sometimes a problem when the match in hand without the other and (77%) of the total study sample did not believe that the treatment of wares or restorations impact on the jaw, while it was found that (12.7%) of the study sample believe that the treatment of wares or restorations, while it was found that (10.3%) of individuals in the study sample sometimes think that the treatment of wares or restorations impact on the jaw and (75%) of the total study sample have not visited the Dentist to explain to him the problem that suffer from it, while it was found that (19.3%) of the study sample had visited the Dentist to explain to him the problem that they have, while it was found that (5.7% ) of the study sample who sometimes visit the dentist to explain to him the problem which they suffer. And (91%) of the total study sample did not use the combination to prevent grinding the teeth during sleep, while it was found that (5.3% ) of the study sample used the combination to prevent grinding the teeth during sleep, while it was found that (3.7%) of the study sample in some often use the combination to prevent teeth grinding during sleep. Table 11: Relationship between TMD and other variables. Our research was focused to find a relationship of TMD with FPD and restorative treatment in Riyadh city. Data collection was carried out by means of a self-applied questionnaire. The etiology of TMD has been considered to be one of the most controversial issues in clinical dentistry. A majority of dental practitioners believe that occlusal disturbances can cause or are closely related to TMD, and many therefore also include occlusal adjustment as an initial treatment for TMD, whereas most TMD experts hold opposing views[4-6]. Few studies have been reported on the prevalence of TMD in Saudi Arabia in normal permanent dentition and adults[8,9]. Restorative procedures are divided into two types-(1) Operative and (2) fixed prosthodontic. Operative procedures are those in which the final restorations are fabricated intrao-rally (e.g., an amalgam, a composite resin). Fixed prosthodontic procedures are those that involve extraoral fabrication with final adjustment and cementation in the mouth (e.g., inlays, onlays , full crowns, fixed partial dentures. TMD relation with other diseases (-0.97) cause of 98% of our sample didn’t complain of medical problem. Because many other conditions can cause similar symptoms to TMD –including toothache, sinus problems, arthritis, or gum disease – your dentist will conduct a careful patient history and physical examination to determine the cause of your symptoms. This research discusses and reviews correlation of TMD with FPD and restorative treatment, including role of FPD, restorative treatment and many factors in TMD. Causes of TMD are not clear, but dentists believe that symptoms arise from problems with the muscles of the jaw or with the parts of the joint itself. Carefully, observed patient history and physical examination to determine the cause of TMD symptoms. It still need more and more research to clarify this problem, its causes in Saudi Arabia. Also, should be community awareness of TMD problem and its symptoms and signs. Thanks Prof. Magdy Hamam for his efforts and guidance in our research. 1. De Boever, J.A., Carlsson, G.E., Klineberg, I.J. Need for occlusal therapy and prosthodontic treatment in the management of temporomandibular disorders. Part I. Occlusal interferences and occlusal adjustment. (2000) J Oral Rehabil 27(5): 367-379. 2. De Boever, J.A., Carlsson, G.E., Klineberg, I.J. Need for occlusal therapy and prosthodontic treatment in the management of temporomandibular disorders. (2000) Journal of Oral Rehabilitation 27(8): 647-659. 3. Laskin, D., Gale, E. The President’s Conference on the Examination, Diagnosis and Management of Temporomandibular Disorders. (1982) American Dental Association Chicago. 4. LeResche, L., Saunders, K., Von Korff, M.R., et al. Barlow, and S.F. Dworkin, Use of exogenous hormones and risk of temporomandibular disorder pain. (1997) Pain 69(1-2): 153-160. 5. Glaros, A.C., Glass, E.G., McLaughlin, L. Knowledge and beliefs of dentists regarding temporomandibular disorders and chronic pain. (1994) Journal of oro facial pain 8(2): 216-222. 6. Arbree, N.S., Campbell, S.D., Renner, R.P., et al. A survey of temporomandibular disorder conducted by the Greater New York Academy of Prosthodontics. (1995) J Prosthet Dent 74(5): 512-516. 7. Okeson, J.P. Management of temporomandibular disorders and occlusion. (2014) Elsevier Health Sciences. 8. Farsi, N.M.A. Symptoms and signs of temporomandibular disorders and oral parafunctions among Saudi children. (2003) Journal of oral rehabilitation 30(12): 1200-1208. 9. Jagger, R.G., Wood. C. Signs and symptoms of temporomandibular joint dysfunction in a Saudi Arabian population. (1992) Journal of oral rehabilitation 19(4): 353-359. 10. Okeson, J.P. Orofacial pain: guidelines for assessment, diagnosis, and management. (1996) Quintessence Publishing. 11. Zarb, G., Bolender, C., Carlsson, G. Single complete dentures opposing natural or restored teeth: Boucher’s prosthodontic treatment for edentulous patients; 11th edn. (1997) Mosby St. Louis Missouri 418. 12. Gazit, E., Fitzig, S., Lieberman, M.A. Reproducibility of occlusal marking techniques. (1986) J Prosthet Dent 55(4): 505-509. 13. Takai, A., Nakano, M., Bando, E., et al. Influence of occlusal force and mandibular position on tooth contacts in lateral excursive movements. (1995) The Journal of prosthetic dentistry 73(1): 44-48. 14. Hellsing, G. Occlusal adjustment and occlusal stability. (1988) The Journal of prosthetic dentistry 59(6): 696-702. 15. Clark, G.T. Etiologic theory and the prevention of temporomandibular disorders. (1991) Adv Dent Res 5(1): 60-66. 16. Tsukiyama, Y., Baba, K., Clark, G.T. An evidence-based assessment of occlusal adjustment as a treatment for temporomandibular disorders. (2001) The Journal of prosthetic dentistry 86(1): 57-66. 17. Mathew, A.L., Sholapurkar, A.A., Pai, K.M. Condylar changes and its association with age, TMD, and dentition status: a cross-sectional study. (2011) International journal of dentistry. 18. Temporomandibular Joint Disorders (TMD, TMJ).